The Spin-Clean Record Washer MKII is a must for all audiophiles, record collectors, and vinyl enthusiasts – and is the best-selling record cleaning device in the world! 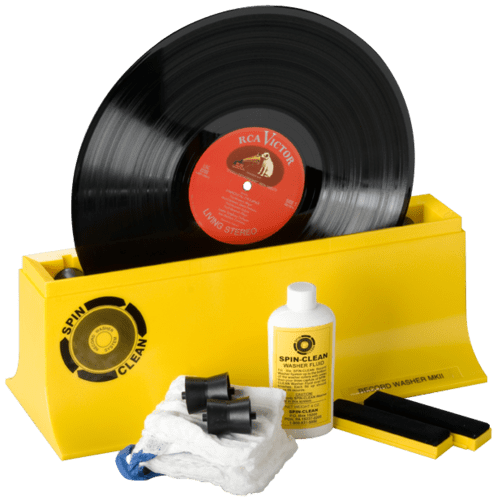 Never has any vinyl record cleaning product offered such an inexpensive and safe way to unlock the true acoustic dynamic range of your LPs, 78s, and 45s. As further insurance for your investment, the Spin-Clean Record Washer MKII comes with a Limited Lifetime Warranty on all parts excluding brushes for wear and tear. Don’t be fooled by other imitation products on the market. The Spin-Clean Record Washer MKII has a four-decade reputation for reliability and effectiveness. There are never any harmful agents or alcohol in the Spin-Clean Record Washer Fluid, so your valued collection is always in good hands. We know that once you try the Spin-Clean Record Washer MKII, record care will never be this easy again. Your cherished record collection will have never sounded better. With the Spin-Clean MKII standard unit and included accessories, you’re ready to begin removing the grime from your grooves.